2 Out of the initial 7,000-strong Greek army, all but 1,400 were dismissed on the third day. In the Battle of Thermopylae of 480 B.C.E. an alliance of Greek city-states fought the invading Persian army at the pass of Thermopylae. Vastly outnumbered, the Greeks delayed the enemy in one of the most famous last stands of history. A small force led by King Leonidas of Sparta blocked the only road through which the massive army of Xerxes I could pass. The Persians succeeded in defeating the Greeks but sustained heavy losses, incredibly disproportionate to those of the Greeks. A local resident named Ephialtes betrayed the Greeks, revealing a mountain path that led behind the Greek lines. Dismissing the rest of the army, King Leonidas stayed behind with 300 Spartans, 400 Thebans, and 700 Thespian volunteers. Though they knew it meant their own deaths, they secured the retreat of the other Greek forces. The losses of the Persian army alarmed Xerxes. When his navy was later defeated at Salamis he fled Greece, leaving only part of his force to finish the conquest of the nation. That force was defeated at the Battle of Plataea. The Battle of Thermopylae can be understood in terms of an "us" and "them" polarity that suggests an East-West dichotomy, with the West representing order, self-restraint, and freedom while the East represents the opposite. In this process, Xerxes was "an ideal person to be chosen as an example of Asian despotism and excessive hubris.". Xerxes I, king of Persia, had been preparing for years to continue the Greco-Persian Wars started by his father, Darius. In 481 B.C.E., after four years of preparation, the Persian army and navy arrived in Asia Minor. A bridge of ships had been made at Abydos. This allowed the land forces to cross the Hellespont. This number needs to be nearly doubled in order to account for support troops, and thus Herodotus reports that the whole force numbered 5,283,220 men, a figure which has been rejected by modern historians. The poet Simonides, who was a near-contemporary, talks of four million. Ctesias of Cnidus, Artaxerxes Mnemon's personal physician, wrote a history of Persia according to Persian sources that unfortunately has not survived, but gives 800,000 as the total number of the original army that met in Doriskos, Thrace, after crossing the Hellespont. Modern scholars have given different estimates based on knowledge of the Persian military systems, their logistical capabilities, the Greek countryside, and supplies available along the army's route. One school of thought rejects the figures given in ancient texts as exaggerations on the part of the victors. Based on analysis of the resources available to armies of the ancient era, the Persian force numbered between 60,000 and 120,000 combatants, plus a retinue of non-combatants, made larger because of the presence of the Persian king and high-ranking nobility. The upper limit was 250,000 total land forces. The main reason most often given for these values is a lack of water; Sir Frederick Maurice, a British general in World War I, was among the first to claim that the army could not have surpassed 175,000, due to lack of water. A second school contends that ancient sources do give realistic numbers. According to the texts, the Greeks at the end of the battle of Plataea mustered 110,000 (Herodotus) or 100,000 (Pompeius) troops: 38,700 hoplites and 71,300 or 61,300 peltasts respectively, the difference probably being 10,000 helots. In that battle, according to Herodotus, they faced 300,000 Persians and 50,000 Greek allies. This gives a 3-to-1 ratio for the two armies, which proponents of the school consider a realistic proportion. Furthermore, Munro and Macan argue for realism based on Herodotus giving the names of 6 major commanders and 29 μυρίαρχοι (muriarxoi)—leaders of the baivabaram, the basic unit of the Persian infantry, which numbered about 10,000 strong. As troops were lost through attrition, the Persians preferred to dissolve crippled baivabarams to replenish the ranks of others. Adding casualties of the battles and attrition due to the need to guard cities and strategic objectives yields a force of 400,000 minimum. According to this view, there was no lack of water. The available surface water in Greece today satisfies the needs of a much larger population than the number of Xerxes' troops, though the majority of that water is used for irrigation. This thesis, however, overlooks the presence of the civilian population. Nicholas Hammond accepts 300,000 Persians at the battle of Plataea, though he claims that the numbers at Doriskos were smaller, without explaining how the change in numbers happened. The metrologist Livio Catullo Stecchini argues that Ctesias's figure of 800,000 battle troops for the Persian army is accurate and that Herodotus's figure of 1,700,000 includes both battle and support troops. Dr. Manousos Kampouris argues that Herodotus' 1,700,000 for the infantry plus 80,000 cavalry (including support) is realistic for various reasons, including the size of the area from which the army was drafted (from modern-day Libya to Pakistan), the lack of security against spies, the ratios of land troops to fleet troops, of infantry to cavalry and Persian troops to Greek troops. On the other hand, Christos Romas believes that the Persian troops accompanying Xerxes were a little over 400,000. Opuntian Locrians All they had. To this number must be added 1,000 other Lacedemonians mentioned by Diodorus Siculus and perhaps 800 auxiliary troops from other Greek cities. Diodorus gives 4,000 as the total of Greek troops, and Pausanias 11,200. Modern historians, who usually consider Herodotus more reliable, prefer his claim of 7,000 men. Why did Leonidas only bring 300 men? Apparently at the time there was a religious festival in Sparta, and the soldiers, by law, were not allowed to travel. The only exception to this was Leonidas's body guard of 300 men. After the expedition to Greece was under way, Xerxes sent messengers to all the states offering blandishments if they would submit and asking earth and water from their soil as a token of submission. Many smaller states submitted. The Athenians threw their envoys into a pit, and the Spartans threw theirs into a well, taunting them with the retort, "Dig it out for yourselves." Support gathered around these two leading states. A congress met at Corinth in late autumn of 481 B.C.E., and a confederate alliance of Greek city-states was formed. It had the power to send envoys asking for assistance and to dispatch troops from the member states to defensive points after joint consultation. There is no evidence that any one state was in charge. Herodotus calls them simply "the Greeks" or "the Greeks who had banded together." The interests of all the states played a part in determining defensive strategy. Nothing else is known about the internal workings of the congress or the discussion during its proceedings. 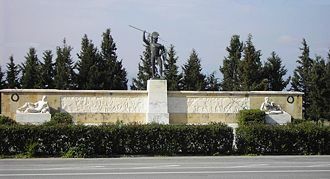 The Persian army first encountered a joint force of 10,000 Athenian and Spartan hoplites led by Euanetus and Themistocles in the vale of Tempe. Upon hearing this, Xerxes sent the army through the Sarantaporo strait, which was unguarded, and sidestepped them. The hoplites, warned by Alexander I of Macedon, vacated the pass. The allied Greeks judged that the next strategic choke point where the Persian army could be stopped was Thermopylae. They decided to defend it as well as to send a fleet to Artemision, a naval choke point. Xerxes' army was being supplied and supported by sea. Using the fleet they might also have crossed Maliacos bay and outflanked the Greek army again. But while Greece showed these inclinations [to join the Persians], the Athenians, for their part, embarked in their ships and hastened to the defence of Artemisium; while the Lacedaemonians and some of their allies went off to make a stand at Thermopylae, judging that the narrowness of the ground would enable them to secure the passage. Some modern historians, such as Bengtson, claim that the purpose of the land force was to slow down the Persian army while the Persian navy was defeated at sea. Another theory is that the land army was to hold the Persian army in the north for as long as possible, and defeat it through attrition, epidemics, and food deprivation. 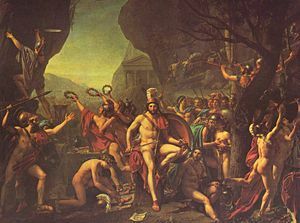 Some have argued that the Athenians felt confident of the small force and Leonidas' presence being enough to stop the Persians, otherwise they would have already vacated their city and sent their whole army to Thermopylae. Historians know of one case in which a small force did stop a larger invading force from the north; in 353 B.C.E./352 B.C.E. the Athenians managed to stop the forces of Philip II of Macedon by deploying 5,000 hoplites and 400 horsemen. The force with Leonidas was sent forward by the Spartans in advance of their main body, that the sight of them might encourage the allies to fight, and hinder them from going over to the Medes, as was likely they might have done had they seen that Sparta was backward. They intended presently, when they had celebrated the Carneian Festival, which was what now kept them at home, to leave a garrison in Sparta, and hasten in full force to join the army. The rest of the allies intended to act similarly; for it happened that the Olympic Festival fell exactly at this same period. None of them looked to see the contest at Thermopylae decided so speedily; wherefore they were content to send forward a mere advance guard. Such accordingly were the intentions of the allies. The Spartan king was put in charge of the army at Thermopylae. Of his leadership, Herodotus says only that they especially looked up to him. He was convinced that he was going to certain death, which he would not have been if he had thought the forces given him were adequate for a victory. He selected only men who had fathered sons that were old enough to take over the family responsibilities. Plutarch mentions in his Sayings of Spartan Women, that after encouraging her husband before his departure for the battlefield, Gorgo, the wife of Leonidas I asked him what she should do when he had left. To this he replied, "Marry a good man and have good children." Another common saying of Spartan Women was, "Come home with your shield or on it," meaning that the soldier was to return home either victorious (with your shield) or dead— carried away from the battle field (on their shield), rather than fleeing the battle and dropping their shield in cowardice (as it was too heavy a piece of armor to carry while running). At the time, the pass of Thermopylae consisted of a track along the shore of the Gulf of Malis so narrow that only one chariot could pass through. On the southern side of the track stood the cliffs, while on the north side was the gulf. Along the path was a series of three constrictions, or "gates" (pylai), and at the center gate a short wall that had been erected by the Phocians in the previous century to aid in their defense against Thessalian invasions. The name "hot gates" comes from the hot springs that were located there. Today the pass is not that, but is inland, due to infilling of the Gulf of Malis. The old track appears at the foot of hills around the plain, flanked by a modern road. It remains a natural defensive position to modern armies. The Battle of Thermopylae and movements to Salamis. When the Persian army reached the entrance to Thermopylae, the Greeks instigated a council meeting. The Peloponnesians advised withdrawing to the isthmus and defending only the Peloponnesus there. They knew, of course, that the Persians would have to defeat Athens before they could arrive at the isthmus. The Phocians and Locrians, whose states were located nearby, becoming indignant, advised defending Thermopylae and sending for more help. Leonidas thought it best to adopt their plan. Meanwhile the Persians entered the pass and sent a mounted scout to reconnoiter. The Greeks allowed him to come up to the camp, observe them and depart. When the scout reported to Xerxes the size of the Greek force, and that the Spartans were indulging in calisthenics and combing their long hair, Xerxes found the reports laughable. Seeking the counsel of a Greek in his employ, Demaratus, he was told that the Spartans were preparing for battle and that it was their custom to adorn their hair beforehand. They were the bravest men in Greece, he said, and they intended to dispute the pass. Xerxes remained incredulous. According to another account, he did send emissaries to the Greek forces. At first he asked Leonidas to join him and offered him the kingship of all of Greece. Leonidas answered, "If you knew what is good in life, you would abstain from wishing for foreign things. For me it is better to die for Greece than to be monarch over my compatriots." Then Xerxes asked him more forcefully to surrender their arms. To this Leonidas gave his noted answer, Μολών Λαβέ, which means "Come take them." This quote has been repeated by many later generals and politicians, in order to express the Greeks' determination to risk a sacrifice rather than surrender without a fight. It is today the emblem of the Greek First Army Corps. Greek morale was high. Herodotus wrote that when Dienekes, a Spartan soldier, was informed that Persian arrows would be so numerous as to blot out the sun, he remarked with characteristically laconic prose, "So much the better, we shall fight in the shade." Today Dienekes's phrase is the motto of the Greek 20th Armored Division. Xerxes waited four days for the Greek force to disperse. On the fifth day he ordered the Medes and the Cissians to take them prisoner and bring them before him. Xerxes sent in the Medes at first perhaps because he preferred them for their bravery or perhaps, as Diodorus Siculus suggested, because he wanted them to bear the brunt of the fighting—the Medes had been only recently conquered by the Persians. The Medes coming up to take the Greeks prisoner soon found themselves in a frontal assault. The Greeks had camped on either side of the rebuilt Phocian wall. The fact that it was guarded shows that the Greeks were using it to establish a reference line for the battle, but they fought in front of it. Details of the tactics are somewhat scant. The Greeks probably deployed in a phalanx, a wall of overlapping shields and layered spearpoints, spanning the entire width of the pass. Herodotus says that the units for each state were kept together. The Persians, armed with arrows and short spears, could not break through the long spears of the Greek phalanx, nor were their lightly armored men a match for the superior armor, weaponry, and discipline of the Greek hoplites. And yet there are some indications they did not fight entirely in close formation. They made use of the feint to draw the Medes in, pretending to retreat in disorder only to turn suddenly and attack the pursuing Medes. In this way they killed so many Medes that Xerxes is said to have started up off the seat from which he was watching the battle three times. According to Ctesias the first wave numbered 10,000 soldiers and were commanded by Artapanus. The king then withdrew the Medes. Having taken the measure of the enemy, he threw the best troops he had into a second assault: The Immortals, an elite corps of 10,000 men. On his side, Leonidas had arranged a system of relays between the hoplites of the various cities so as to constantly have fresh troops on the front line. Yet in the heat of the battle the units did not get a chance to rotate. Being able to approach the Greek line only in such numbers as the space allowed, the Immortals succeeded no better than the Medes. Xerxes had to withdraw them also. The first day of battle probably ended here. The assault failed again. The account of the slain gives some indication of why: The wall of bodies must have broken up the Persian line and detracted from their morale. History judges them perhaps too harshly. Climbing over the bodies they could see that they had stepped into a killing machine, but the officers behind prevented them from withdrawing. The king at last stopped the assault and withdrew to his camp, totally perplexed. He now knew that a head-on confrontation against Spartan-led troops in a narrow place was the wrong approach. Late on the second day of battle, as the king was pondering what to do next, he received a windfall circumstance: A Malian, named Ephialtes, informed him of a path around Thermopylae and offered to guide them. Ephialtes was motivated by the desire of a reward, though he was later assassinated. The path led from east of the Persian camp along the ridge of Mt. Anopaea behind the cliffs that flanked the pass. It branched, one path leading to Phocis, and the other down to the Gulf of Malis at Alpenus, first town of Locris. Leonidas had stationed 1000 Phocian volunteers on the heights to guard this path. For all their previous indignation and insistence on a defense at Thermopylae, they were not prepared: There were no advance positions, sentinels or patrols. Their first warning of the approach of the Immortals under Hydarnes was the rustling of oak leaves at first light on the third day of the battle. Herodotus says that they "jumped up," suggesting that they were still asleep, and were "greatly amazed," which no alert unit should have been. Hydarnes was as amazed to see them hastily arming themselves. He feared that they were Spartans, but was enlightened by Ephialtes. Not wishing to be delayed by an assault, Hydarnes resorted to a tactic that later turned out to be the winning one: He fired "showers of arrows" at them. The Phocians retreated to the crest of the mountain, there to make a last stand (their story). The Persians branched left to Alpenus. For this act, the name of Ephialtes received a lasting stigma: It means "nightmare" and is synonymous with "traitor" in Greek. None of the actions of the Persians were a surprise to Leonidas. From a variety of sources, he was kept apprised of their every move, receiving intelligence of the Persian outflanking movement before first light. When Leonidas learned that the Phocians had not held, he called a council at dawn. During the council some Greeks argued for withdrawal in the face of the overwhelming Persian advance, while others pledged to stay. After the council, many of the Greek forces did choose to withdraw. Herodotus believed that Leonidas blessed their departure with an order, but he also offered the alternate point of view: That those retreating forces departed without orders. The Spartans had pledged themselves to fight to the death, while the Thebans were held as hostage against their will. However, a contingent of about 700 Thespians, led by general Demophilus, the son of Diadromes, refused to leave with the other Greeks, but cast their lot with the Spartans. Ostensibly the Spartans were obeying their oath and following the oracle from Delphi. However, it might also have been a calculated strategy to delay the advance of the Persians and cover the retreat of the Greek army. In fact, with the Persians so close at hand, the decision to stand and fight was probably a tactical requirement, one made more palatable by the oracle. The significance of the Thespians' refusal to leave should not be ignored. The Spartans, as brave as their sacrifice indubitably was, were professional soldiers, trained from birth to be ready to give their lives in combat as Spartan law dictated. Conversely, the Thespians were citizen-soldiers (Demophilus, for example, made his living as an architect) who elected to add whatever they could to the fight, rather than allow the Spartans to be annihilated alone. Though their bravery is often overlooked by history, it was most certainly not overlooked by the Spartans, who are said to have exchanged cloaks with the Thespians and promised to be allies for eternity. At dawn Xerxes made libations. He paused to allow the Immortals sufficient time to descend the mountain, and then began his advance. The Greeks this time sallied forth from the wall to meet them in the wider part of the pass, in an attempt to slaughter as many as they could. They fought with spears until every spear was shattered and then switched to xiphoi (short swords). In this struggle Herodotus tells that two brothers of Xerxes fell, Abrocomes and Hyperanthes. Leonidas also died in the assault. Receiving intelligence that Ephialtes and the Immortals were coming up, the Greeks withdrew and took a stand on a small hill behind the wall. The Thebans under Leontiades put hands up, but a few were slain before the surrender was accepted. Some of the remaining Greeks were fighting with their hands and teeth. Tearing down part of the wall, Xerxes ordered the hill surrounded and the Persians rained down arrows until the last Greek was dead. Archaeology has confirmed the arrow shower at the end. When the body of Leonidas was recovered by the Persians, Xerxes, enraged at the loss of so many of his soldiers, ordered that the head be cut off, and the body crucified. This was very uncommon for the Persians: They had the habit of treating enemies that fought bravely against them with great honor, as the example of Pytheas captured earlier, off Skyros shows. Xerxes, however, was known for his rages, as when he had the Hellespont whipped because it would not obey him. After the departure and defeat of the Persians, the Greeks collected their dead and buried them on the hill. A stone lion was erected to commemorate Leonidas. Forty years after the battle, Leonidas' body was returned from Thermopylae to Sparta, where he was buried again with full honors and funeral games were held every year. The simultaneous naval Battle of Artemisium was a draw, whereupon the Athenian navy retreated. The Persians had control of the Aegean Sea and all of Greece as far south as Attica; the Spartans prepared to defend the Isthmus of Corinth and the Peloponnese, while Xerxes sacked Athens, whose inhabitants had already fled to Salamis Island. In September, the Greeks defeated the Persians at the naval Battle of Salamis, which led to the rapid retreat of Xerxes. The remaining Persian army, left under the charge of Mardonius, was defeated in the Battle of Plataea by a combined Greek army again led by the Spartans, under the regent Pausanias. In essence, the Oracle's warning was that either Sparta would be conquered and left in ruins, or one of her two hereditary kings must sacrifice his life to save her. Based on information from Herodotus's The Histories Book VII, the date of Ephialtes's betrayal and use of the mountain path by the Immortals can be narrowed to a few days in September of 480 B.C.E., as follows. Not knowing the terrain, they would have needed some form of light, but torches would have given away their intent. They therefore traversed the path when light from the moon would be the greatest—the full moon. In Book VII Herodotus mentions the solar eclipse that occurred at the crossing of the Hellespont by the Persians. By estimating the distance the Persian Army could move each day, it can be established that the battle took place around September of 480 B.C.E. Tracing back via a lunar calendar, the date of the betrayal can be narrowed to September 18, 19, or 20, 480 B.C.E. The form of this ancient Greek poetry is an elegiac couplet. Some English translations are given in the table below. That we lie here, and that their will was done. ? That we lie here in obedience to their laws ? Here we lie, Obedient. ? How here, obedient to their laws, we fell. ? We lie obedient to them still. that here lie we, their words obeying. ? Obedient to our orders, here we lie ? Ruskin said of this epitaph that it was the noblest group of words ever uttered by man. Thermopylae has been used as a name for ships among shipowners for many centuries. For example, a clipper ship, 212 feet in length and displacing 91 tons, was launched in Aberdeen in 1868. Christened Thermopylae, it established speed records, and was notable for having a male figurehead wearing armor, helmet, shield, and sword. The battle of Thermopylae has become a legend among pro-gun activists, who espouse the phrase, molon labe. from his book "Last Poems." of T. S. Eliot's "Gerontion." και οι Μήδοι επί τέλους θα διαβούνε. it was set to guard Thermopylae. But without hate for those who lie. in honor of other dead, such as those that died during the Imia crisis. "'Go tell it'—what a message"
was inspired by the epitaph of Simonides. Dimitris Varos Ω ξείν… (O stranger) is a poetic book written in 1974. Gates of Fire Steven Pressfield Depicts the battle as told by a squire of Dienekes, who had been wounded during the fight, but was revived to tell Xerxes of the Spartans' heroism. The Spartans Paul Cartledge Published in 2002. It includes a fairly detailed description of the battle fought at Thermopylae, the personal stories of Dienekes, King Leonidas, and a wealth of information about Sparta. Soldier of Arete, 1989 Gene Wolfe Narrated by Latro, a soldier who fought on the Persian side at Plataea (after Thermopylae) and suffered a serious head wound there, which makes him forget everything after 24 hours. Wanderer, kommst Du nach Spa… German author and Nobel Prize in Literature recipient Heinrich Böll Takes its title from the German translation of the inscription on the Spartans' tomb. In it a young German soldier at the end of the Second World War is wounded on the Eastern Front and is brought to a field hospital which was a school. He wonders if it could be his school, which he only recently left to become a soldier. On seeing the partially erased quotation of the title on a chalkboard, his question is answered. Halo: The Fall of Reach Eric Nylund Refers to the Thermopylae battle, although in the book the Spartans come out victorious, but it is likely that it is speaking of the earlier assaults by Xerxes being repulsed by the Spartans. It should be noted that most of the Spartans were killed in the sequel, Halo: First Strike. Graphic novel 300 Written, penciled, and inked by Frank Miller (with painted colors by Lynn Varley) Depicts the Battle of Thermopylae and the events leading up to it from the perspective of Leonidas. The comic was particularly inspired by the film, The 300 Spartans. Ghost, 2004 John Ringo Includes a description of the battle fought at Thermopylae, and quotes Simonides' epigram. The Spartan Valerio Massimo Manfredi Gives an account of the Battle of Thermopylae. The novel uses the battle to set up one of the protagonists ,who is apparently sent out on a mission by King Leonidas before the final Persian attack. The 300 Spartans 1962 Depicts the Battle of Thermopylae. Go Tell the Spartans 1978 Makes direct reference to Thermopylae, comparing the French defenders of a Vietnamese village to the Spartans, and forecasting the same result for a later generation of American soldiers. In this case, the technology is on the side of the defenders. The Last Samurai 2003 Captain Nathan Algren reflects on the Battle of Thermopylae before engaging in a similar battle between traditional Japanese samurai and a far superior modernized army equipped with firearms and cannons. In the movie, Algren states that 300 Greek soldiers held off a million Persian warriors, until they lost their will to fight. The Samurai leader, Katsumoto, expresses his admiration for the bravery of the Greek warriors. Later, when Katsumoto asks what happened to the warriors at Thermopylae, Algren replies with a grim smile, "Dead to the last man." 300 2007 Based on Frank Miller's graphic novel 300, a loose retelling of the battle from the perspective of Leonidas. ↑ David Johnson, The Persian Wars. Retrieved September 10, 2007. ↑ Herodotus, (edited by C.E. Godley) The Histories, VII,7. Retrieved September 5, 2007. ↑ Herodotus, The Histories, VII, 60 The Histories VII,60 Retrieved September 5, 2007. ↑ Herodotus, The Histories VII,87. Retrieved September 5, 2007. ↑ Herodotus, The Histories VII,184. Retrieved September 5, 2007. ↑ Herodotus, The Histories VII,186. Retrieved September 5, 2007. ↑ Frederick Maurice, "The size of the army of Xerxes in the invasion of Greece 480 B.C.E., Journal of Hellenistic Studies 50: 115-128. ↑ J.A.R. Munro, The Cambridge Ancient History vol IV, (Cambridge: Cambridge University Press, 1929). ↑ Metrum.org, The Size of the Persian Army. Retrieved September 5, 2007. ↑ Herodotus, 202The Histories, VII, 202. Retrieved September 5, 2007. ↑ Siculus, Library book XI,5 at Tufts University Contents of the Eleventh Book Retrieved September 5, 2007. ↑ Herodotus, The Histories VII,145. Retrieved September 5, 2007. ↑ Herodotus, The Histories VII,173. Retrieved September 5, 2007. ↑ Herodotus, The Histories VII,175. Retrieved September 5, 2007. ↑ Lysias, Funeral oration 30, translated by W.R.M. Lamb, M.A., (New York: G.P. Putnam, 1930). ↑ Hermann Bengtson, Griechische Geschichte von den Anfängen bis in die rö̈mische Kaiserzeit (Munich: Beck, 1969). ↑ Herodotus, The Histories VII.206 entire. ↑ Herodotus, The Histories VII,176. Retrieved September 5, 2007. ↑ Plutarch, Moralia, 225, 10; Plutarch, and Frank Cole Babbitt. Plutarch's Moralia (London: W. Heinemann, 1927). ↑ Diodorus Siculus, Contents of the Elenth Book. Retrieved September 5, 2007. ↑ Herodotus, Book VII, 225. ↑ Reed College, Thermopylae. Retrieved September 5, 2007. ↑ Herodotus, The Histories VII,181. Retrieved September 5, 2007. ↑ Herodotus, The Histories 7.35. ↑ Greek Texts, Polymnia. Retrieved September 5, 2007. Hammond, Nicholas G.L. "Sparta at Thermophylae," Historia: Zeitschrift für Alte Geschichte, Vol. 45, No. 1. (1996), pp. 1–20. Morris, Ian Macgregor. "To Make a New Thermopylae: Hellenism, Greek Liberation, and the Battle of Thermopylae," Greece & Rome. Vol. 47, No. 2. (2000): pp. 211–230. The battle in Herodotus' Histories. Free 2 player Thermopylae online game. Ctesias fragment from Photius's Myriobiblion. Thermopylae In Our Time BBC Radio 4. History of "Battle of Thermopylae"
This page was last modified on 20 May 2016, at 22:16.